Warner Brothers Animation, Cartoon Network and the Television Academy teamed up to do a powerful tribute to the life and work of late great Dwayne McDuffie. There was an amazing line up of speakers from every period in Dwayne’s life and all of them told me something about the man I didn’t know. There was video shot and hopefully we’ll have transcripts of all the wonderful words said that day. Charlotte McDuffie, Dwayne’s wife, asked me to be the host of the event. It was an honor. Other speakers included Black Enterprise Editor-in-Chief and Milestone co-founder Derek Dingle, Producer Alan Burnett, animation legend Bruce Timm, Yuri Lowenthal (the voice of BEN 10), Emmy Award winning writer Stan Berkowitz, master artist and Milestone co-founder Denys Cowan, Dwayne’s college buddy Jon Porter, producer Glen Murakami, producer and executive Linda Steiner, writer and Dwayne’s best friend Matt Wayne, and the voice of Static and Green Lantern Phil LaMarr. Sid Jacobson, who was Dwayne’s editor on DAMAGE CONTROL, was sick and could not attend so I read his remarks. There were many notables in the audience, including our own Redjack and many other “FOD” (Friends of Dwayne). A long list. Looking back, I should have taken a lot of pictures, but I only took one. 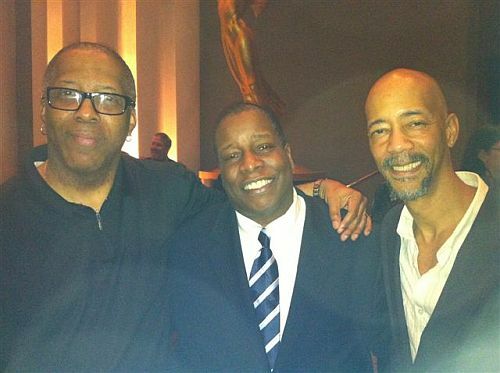 Here are the remaining founders of Milestone Media: Michael Davis, Derek Dingle and Denys Cowan. If you’re not up on Dwayne’s writing, go to Reggiesworld.com and pick up any of his paperbacks and DVDs. We’ve got a page dedicated to his body of work. Or cut to the chase and get them all. Once you see how he elevated the game you’ll want them all eventually.